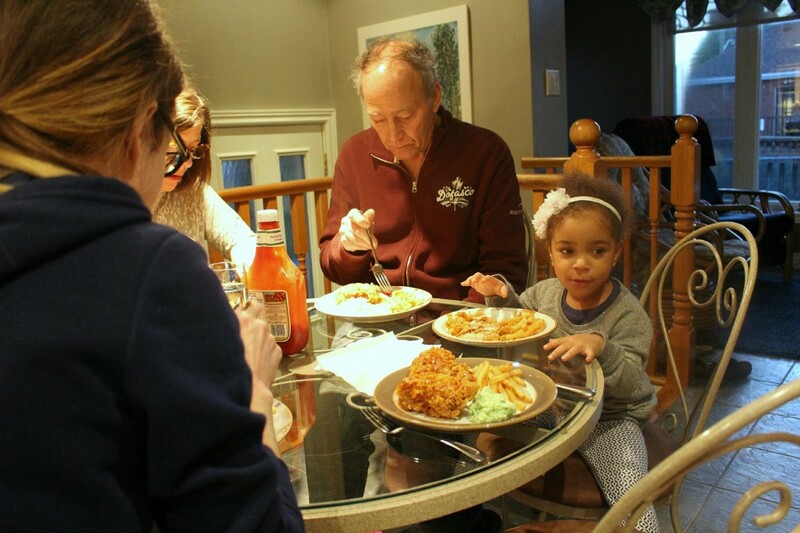 Dinner Party with my Family and KFC #sweetchilicrunch - Frugal Mom Eh! 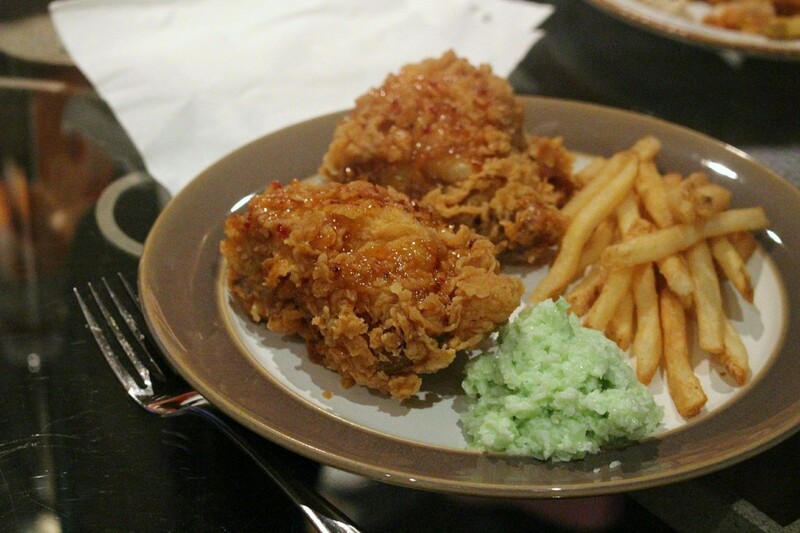 I recently had the opportunity to visit the KFC test kitchen and experience what goes on behind the scenes. This included an exciting (and delicious!) reveal of the brand new Sweet Chili Crunch Chicken. There is just something about the juicy, tender chicken and the delicious crunchy skin of KFC chicken that just can’t be beat. Ordering out KFC for dinner is such a nice break from doing things the hard way myself and a welcome break from the usual fighting to get my 2 year old to eat her dinner. Ever since my experience at the KFC test kitchen I’ve been raving to my family about how good the new Sweet Chili Crunch flavour is. I planned to have a little dinner party with my parents and sister and order some KFC for take-out. I just love being able to get together for a nice low-key dinner. It’s stress free and a nice break for everyone. Keira was thrilled as soon as she saw the brown paper bags come in the door. An insta-grin went up and the chants of “chicken and friiies!” started up. She even got excited about the coleslaw and macaroni. It didn’t take long before she had enough of me trying to take pictures and grabbed a fork in an attempt to get to her chicken and fries. I got the hint and we all filled up our plates for dinner. I ended up ordering an 18 piece bucket of the Sweet Chili Crunch Chicken because I had been looking forward to eating some again. We also got a 9 piece bucket of original chicken because my mom wasn’t sure what she would think of the Chili Crunch. You can actually get a variety bucket (starting at $19.99) that includes both the Sweet Chili Crunch and the original chicken. I was just super excited about the Sweet Chili Crunch. Now this is something I enjoy putting in front of my family for dinner as a delicious treat! Personally, I love my KFC chicken and fries with their coleslaw. The coleslaw is so refreshing and delicious plus it creates a good balance with the chicken and fries. The perfect side if you ask me! 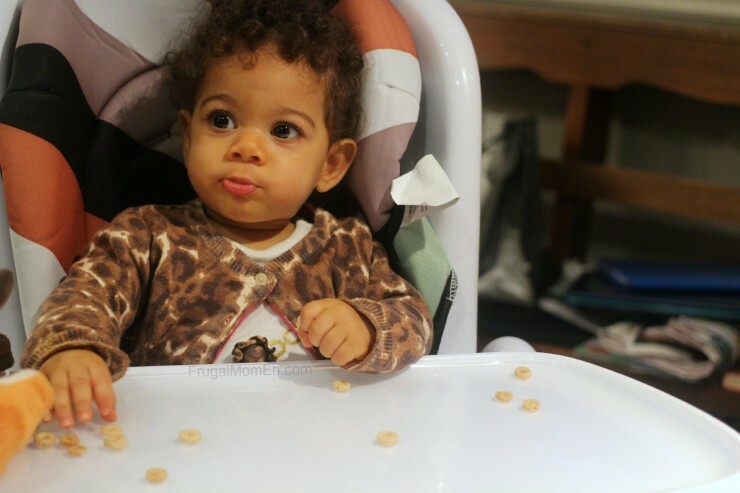 Ava really enjoyed getting together for an easy family dinner too! She was eyeing our chicken but settled for some of her favourite cereal. 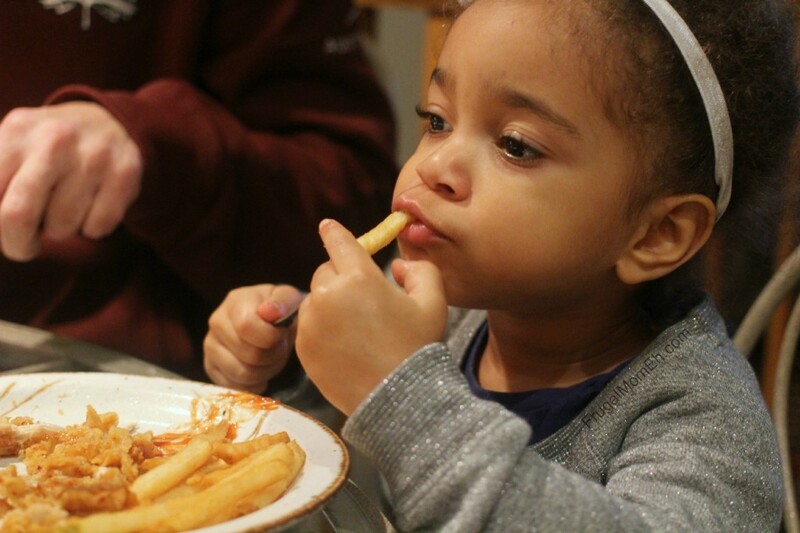 It won’t be long before she starts getting excited for chicken and fries too! 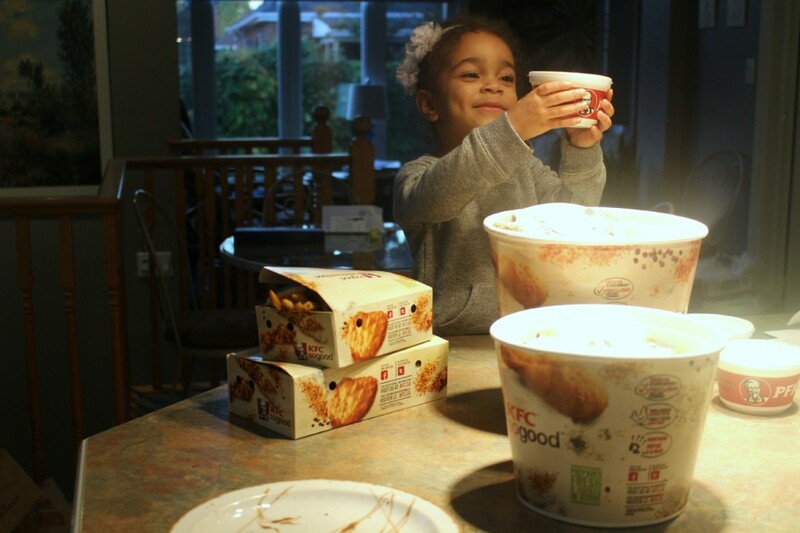 We are obsessed with KFC in our house. Love it. Ahhh love KFC!!! We did this for my moms birthday this past year!!! So yummy!! L:ooks like everyone is having a yummy good time! You have a beautiful family. 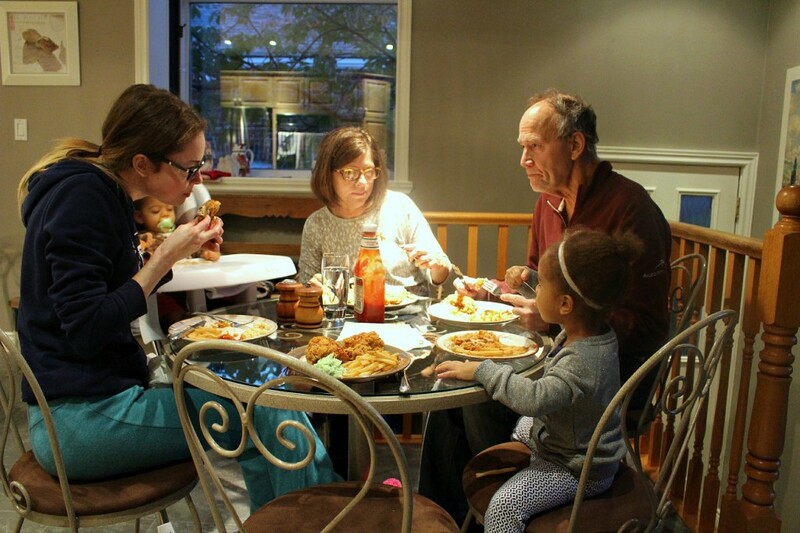 Family dinners are so very important. That flavor sounds absolutely delicious. Of course, I’m all about their mashed potatoes and biscuits too! We eat KFC a couple times a month. I can’t wait to try this with cole slaw and mashed potatoes. You can’t go wrong with KFC, they’ve got delicious chicken! KFC is one of my favorite fast food, I love their zinger burgers! Will try the sweet chili. 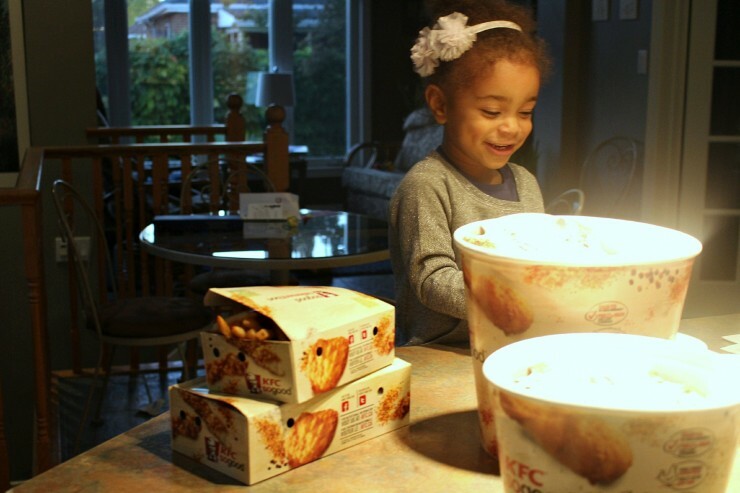 Kids really love it when parents order KFC chicken. There’s something in the recipe that makes kids easy to feed. KFC chicken and coleslaw? Ah, you’re making me hungry! I love KFC and I always enjoy eating it with the family too – yumyum! We love KFC! It is always so delicious. Thanks for the post. The smile on Kiera’s face as she pulls out the sides is priceless! I have been wanting to try the new flavor. I will have to get some tomorrow night when it will be just me for dinner. Looks yummy! Haven’t had KFC in years! On a side note, your girls is precious! Hmmm…delicious. I am KFC fans, too bad we don’t have it on our city. I haven’t tried their new recipe yet, I’ll have to fix that. As of now, I am seriously hooked on KFC poutine. I am a sucker for KFC mashed potatoes. I love the sound of the sweet chili. Yumm! We love KFC! Perfect family dinner! I used to love eating KFC. Their biscuibiscuits and honey are so yummy. That chicken looks delicious! Makes me want to have that tonight for dinner! It has been awhile since we have had KFC, I think trying the new sweet chili crunch might be a good excuse to have it for dinner one night soon. Oh I love KFC but I haven’t had it in a long time! Sweet Chili Crunch sounds delicious!